Earlier today, I posted up Call of Duty: Modern Warfare [Reflex]'s Nintendo Channel debut data. After looking at the data, you may be think, "Well, how did Call of Duty: Modern Warfare [Reflex] debut compared to The Conduit and perhaps Metroid Prime: Trilogy?" It does seem that the FPS market on the Wii is one that is neglected for the most part, after-all, it's Wii owners that got stuck with the holidays with only ONE first-person shooter, and it's a two year old port of Call of Duty: Modern Warfare. 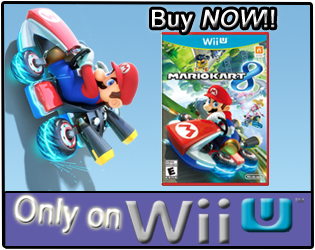 The Conduit boasted before the match, that it was going to have the best controls for a FPS on the Wii, the most robust online multi-player, as well as some powerful graphics, flying high above the rest of the competition. 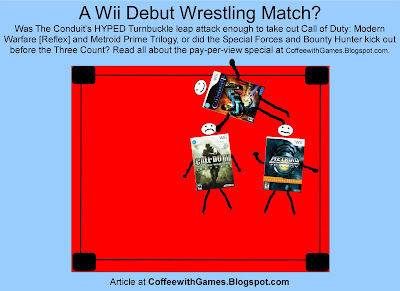 The Conduit was hyped up and many thought it would easily knock-out any FPS game before it on the Wii. Metroid Prime Trilogy boasted before the match, that it would be bringing old school talent, but with new moves, and it would give you the most for your money in one package. Call of Duty: Modern Warfare [Reflex] was extremely humble before the match, not really speaking out much about himself, and some say his former agent(Infinity Ward) had a lot to do with keeping him quiet and humble. 13 days from when The Conduit released, that's how long it took The Conduit to debut with data on the Nintendo Channel. 21 days from when it released, that's how long it took for Metroid Prime Trilogy's Nintendo Channel debut. 20 days, that's how many days it took Call of Duty: Modern Warfare [Reflex] to have game-play data reported on the Nintendo Channel. Days verdict: The Conduit delivered a stunningly fast performance and blasted both Metroid Prime Trilogy and Call of Duty: Modern Warfare [Reflex] with it's speedy attacks, showing it's 13 days of game-play couldn't be beat by just name recognition for the other two. 6,963 players reported data for The Conduit's Nintendo Channel debut. 5,415 players had reported data by the time Metroid Prime Trilogy debuted on the Nintendo Channel. 3,748 players reported the data for Call of Duty: Modern Warfare [Reflex]'s debut. Player verdict: Again, The Conduit showed in this match-up that talking trash and bragging loudly about yourself before a match can help you have fans showing up to support you. The Conduit had 1,548 more fans(players) than Metroid Prime Trilogy and 3,215 more fans than Call of Duty: Modern Warfare [Reflex]. 74,522 total hours were reported for The Conduit's debut. 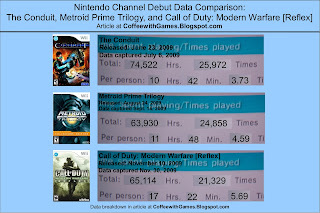 63,930 total hours were reported for Metroid Prime Trilogy's debut. 65,114 total hours were reported for Call of Duty: Modern Warfare [Reflex]'s debut. Total Hours verdict: Again, The Conduit outperformed the Metroid Prime Trilogy and Call of Duty: Modern Warfare [Reflex] in this category. 10 Hrs. 42 Min. reported per gamer for The Conduit's Nintendo Channel debut. 11 Hrs. 48 Min. reported per gamer for Metroid Prime Trilogy's Nintendo Channel debut. 17 Hrs. 22 Min. reported per gamer for Call of Duty: Modern Warfare [Reflex]'s Nintendo Channel debut. Hours Per Fan(Person) verdict: Though Call of Duty: Modern Warfare [Reflex] may have lost the debut match overall to The Conduit, Call of Duty's fans were the most dedicated in giving of their time for support. They were outnumbered by more than 3,000 fans for The Conduit, but Call of Duty's fans must have been camping out late, and stayed late long after the match had ended, and it shows with their match(game) time per person, being nearly 6 hours longer than Metroid Prime Trilogy and nearly 7 hours longer than The Conduit. In the end, I believe it was the hype for The Conduit that High-Voltage Software was able to create for the game, that allowed it to perform better than Metroid and Call of Duty in their first debut. Will there ever be a rematch? Perhaps in the future, but for now, The Conduit can boast having the best FPS debut on the Nintendo Channel for 2009. Have you played any of these games? If so, are you still playing them or have you moved on to something else? Also, if you watch wrestling now, or have in the past, do you have a favorite wrestler? Check the comments for my favorite wrestler! I don't watch wrestling anymore, but Bret Hart was my favorite wrestler. I watched wrestling in the late 90s and stopped around 2000. I was never a fan of WWF(then), and liked WCW more. As of these games, I've only played The Conduit. I'm not playing it currently, as I don't own it anymore. I've always liked Mr. Perfect. He was a pretty boy who knew how to lay down the law. I haven't played any of these games, expect 1/3 of the Metriod Prime Trilogy and that was the first Metriod. 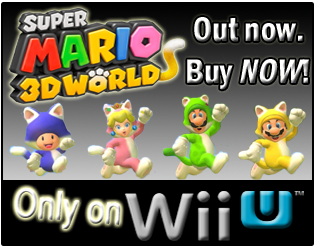 I'd like to go back and play it now with the Wii controls.